The weekend after our first big sampling trip (and again last weekend), we went out to Lion Island in Broken Bay to get some penguin samples from further up the coast of NSW. Lion Island is very different from Bowen Island, not only geographically but also ecologically. Whereas Bowen Island is home to a colony of at least 3000 pairs of Little Penguins, Lion Island only hosts about 300 pairs. The main non-indigenous weed threatening penguin habitat on Bowen Island is Kikuyu grass, whereas Lion Island is infested with Lantana (Lantana camara) and Bitou Bush (Chrysanthemoides monilifera). Unlike Bowen Island, Lion Island also has mammalian predators, i.e. water rats, which we spotted running along the water’s edge at night. Bowen Island is also about 4 times as big as Lion Island and maintained by the Booderee National Park staff, which means that there are paths leading to the house and the north of the island, which allows visitors to move around and explore the island. This is not possible on Lion Island, where the dense vegetation restricted our movements to the beach and rocky shore. There is just enough space for 1-2 tents behind some big boulders on the back of the beach, and I would not be surprised to see this area flooded by waves when the swell is high. 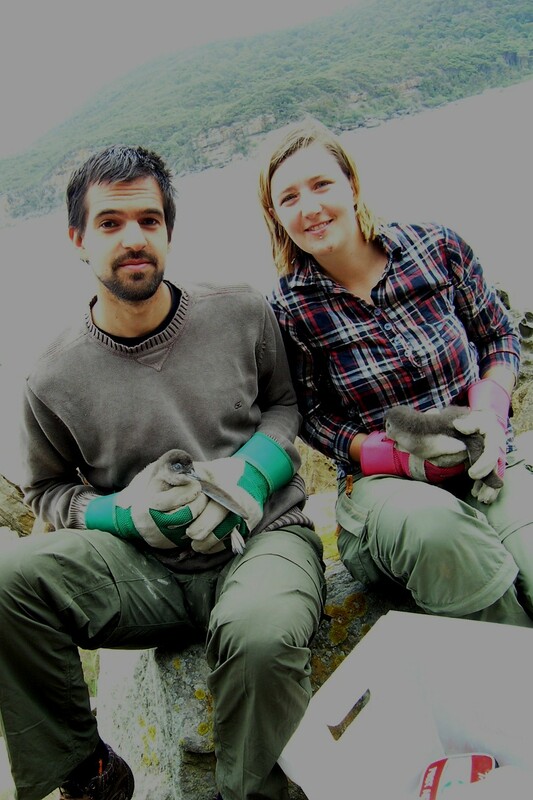 Catching penguins at Lion Island was also a different kettle of fish. The majority of the penguins seem to land on the rocks and only a few (about 10-15 per night) are using the beach to come ashore. We also observed that their feeding trips are much longer than on Bowen Island, where parents taking turns during incubation and chick rearing swap duties every night. It therefore took us much longer to get 50 DNA samples and microchip the penguins for the mark-recapture part of my study. 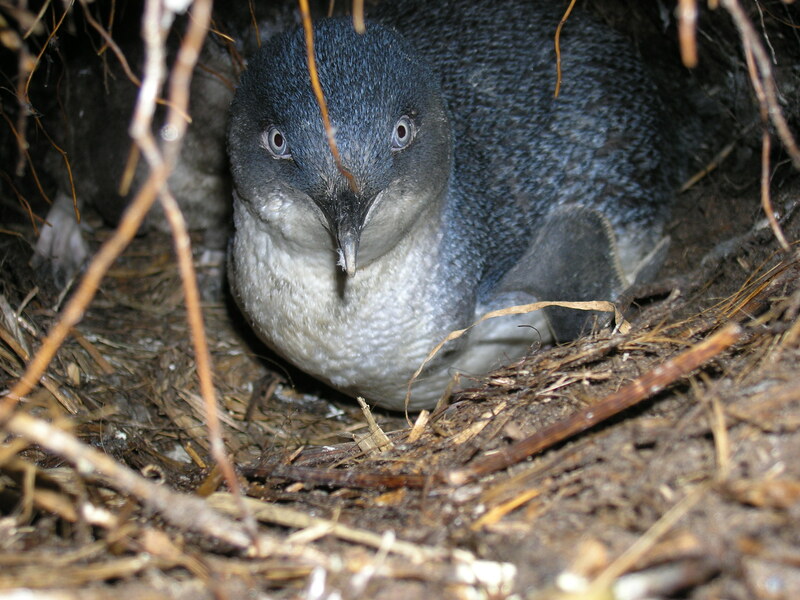 We also took samples from penguin families in their burrows for my study on immune genes. Despite all these challenges, Lion Island is a beautiful place and we witnessed some beautiful sunsets while waiting for the penguins. 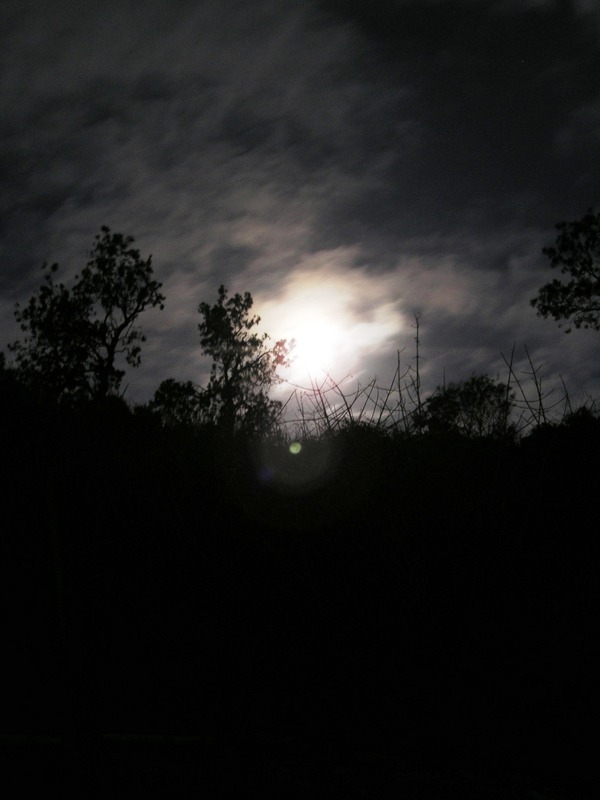 Shortly after dark, a bright moon started illuminating the beach and the penguins might have seen us from a great distance. We are lucky they still walked into our corral! Bowen Island is a tear-shaped sandstone island, about 1.1 km long and 0.6 km wide. It is home to nesting colonies of a number of sea birds, including the Sooty Oystercatcher (Haematopus fuliginosus) and three species of shearwater as well as several thousand breeding pairs of Little Penguins. 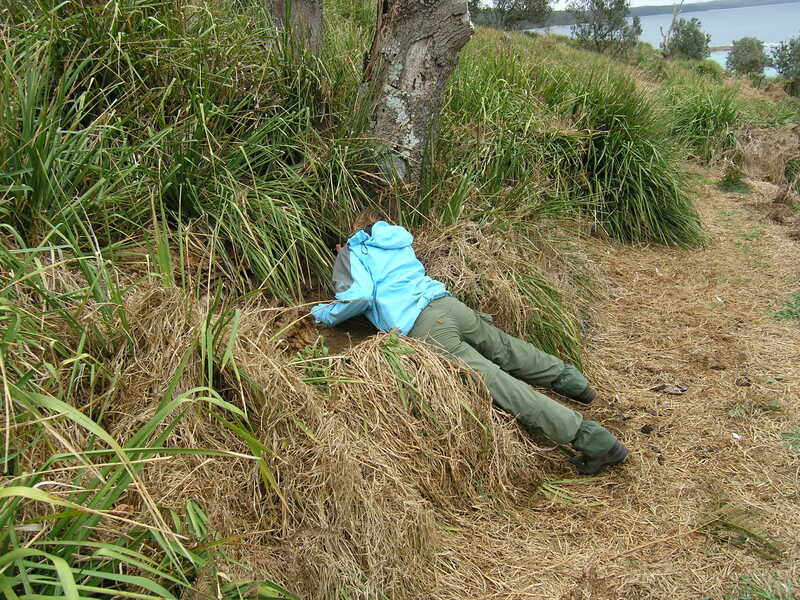 The latter burrow in Basket Grass (Lomandra longifolia) tussocks or find shelter in dense vegetation or under rocks. The island belongs to the Jervis Bay Territory, which is administered by the Australian Federal Government, and part of Booderee National Park. 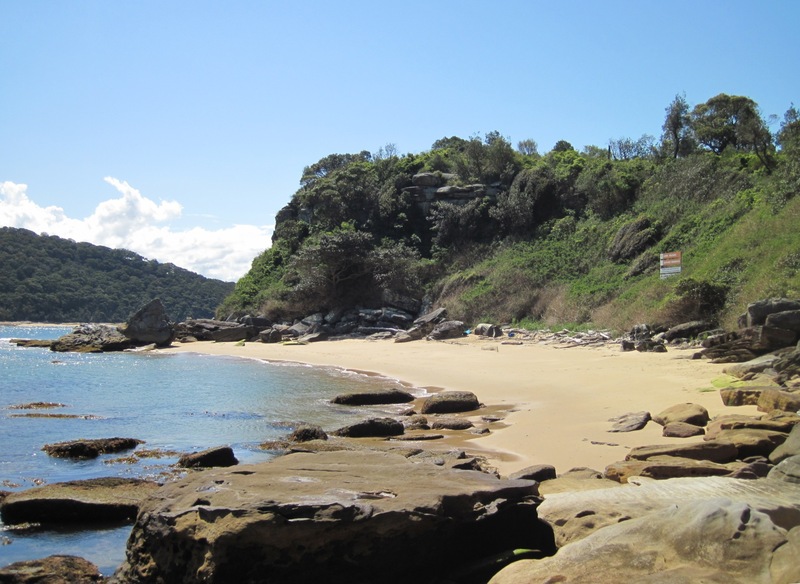 The Park is owned by the Wreck Bay Aboriginal Community and jointly managed with Parks Australia. The National Park staff are extremely helpful and supportive of my research. Last Thursday evening, David and I drove to Jervis Bay to make sure we could get an early start to Bowen Island. Especially during spring, the weather and sea can be quite rough and mornings are generally a better time to get to the landing beach by boat. We were lucky and the wind had changed to a Southerly, which is a safer wind for landing on Bowen Island. Ranger Stewie and Park Services Manager Martin got the Sea Eagle III ready for us and brought us to the island (which is only 250m off the mainland) in a jiffy. Easily accessible burrows that can be monitored over several years to estimate survival rates of the penguins in the colony were what we were looking for. Once found, we marked them with plant tags. 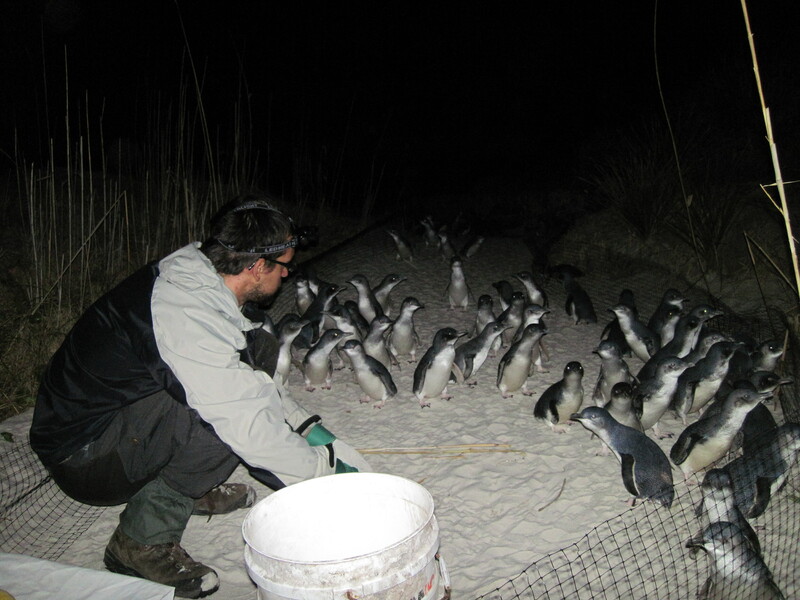 We then set up our corralling fence on the beach to intercept the penguins as they come ashore at night. Not long after late lunch/early dinner, the sun set and we walked back down to the beach, where we did not have to wait long for the first raft of penguins to arrive. We were slightly overwhelmed by the number of penguins that bravely walked into our corral. The decision to shorten the fence, thereby making sure that most of the penguins were not detained from getting to their burrows, was made quickly. The resulting delay meant that during the first night, we only managed to collect 10 DNA samples and microchip five of the penguins, but we were happy that all procedures worked well. During the sampling, we were accompanied by the eery sounds of night birds, and on the way back to the house, we came across a lot of different penguin calls. After a successful first day on the island, we were looking forward to a good night’s sleep in our bunk beds! The second day started with some more burrow searching and marking after breakfast, while a white-bellied sea eagle chased a smaller bird overhead. We also revisited the burrows we had marked the previous day. It turned out that the location of one of them was not described accurately and we never found it again. That taught us to be as precise as possible in our records and use additional landmarks for orientation. 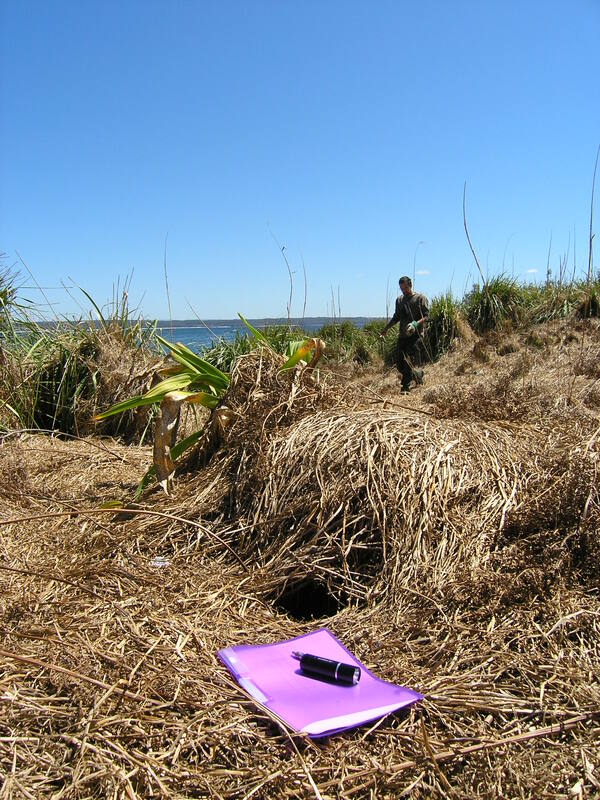 The Island had also been sprayed with herbicide to reduce the invasive Kikuyu grass (Pennisetum clandestinum), which is a threat to Little Penguin breeding habitat. Large parts of the vegetation therefore appeared dead and strawlike, while native plants hopefully reclaim the invaded area. Changes in the vegetation are therefore to be expected. In the afternoon, it started raining. The tin roof of the house made the light rain sound like a steady downpour, so we were pleasantly surprised when we left the house for the second night of penguin capture. 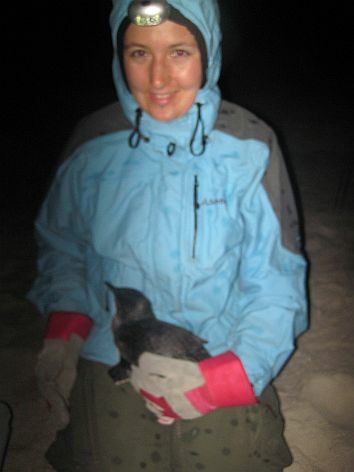 Despite the ongoing rain, we had a very successful run with 25 penguins marked and sampled. The only drawback was the fact that our microchip reader ran out of battery, despite being fully charged at the start of the trip. We therefore ran into the danger of marking the same bird twice, but because we released the birds on the other side of the fence we took them from, that risk was rather low during one sampling night. The second night with the steady rain was even more exhausting than the first one, so we were glad when we finally returned to the house and got out of our smelly sampling clothes – some of the birds had showed how they liked to be handled by releasing squishy bird poo onto us. After Saturday’s rain, Sunday started sunny and we were sweating by the time we had checked all the burrows for occupancy and added some more. At the end of our tour, during which we also saw a whale lobtailing off the coast, we had marked 35 burrows and hope to find all of them when we are be back in two weeks time. Because it was Sunday and we still had a few hours before dusk, we decided to take a dip in the cool water of Jervis Bay, but did not stay long in the alternative penguin habitat. We are lucky the penguins still come ashore, otherwise it would be impossible to catch and release them unharmed! 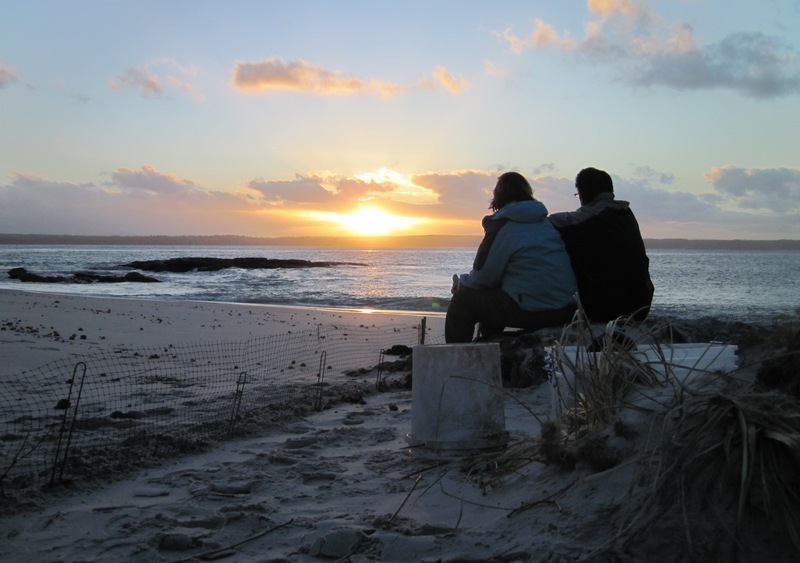 On our last evening on the island, we got to see a beautiful sunset while waiting for the penguins to arrive. We also watched a group of cormorants leaving their favourite rock for their nightly resting and roosting place while the shearwaters returned to the island colony. This time, the first raft was in a great hurry and just ran our fence over, so that we only got hold of a few penguins from that group. We still managed to handle 21 individuals and got our total count to just over 50 individuals, thereby achieving our goal. Now it remains to be seen how many of the marked individuals we can recapture during our next trip to Bowen Island. On Monday, Stewie and Martin picked us up despite the unfavourable weather and we got soaked to the skin while loading the boat, but the dolphins that passed within meters more than made up for this small discomfort! Back on the mainland, we rinsed our gear and the stuff we had borrowed from the National Park, packed the car and were back on the road home to Sydney… for now. It has been a while… but I have not been idle. 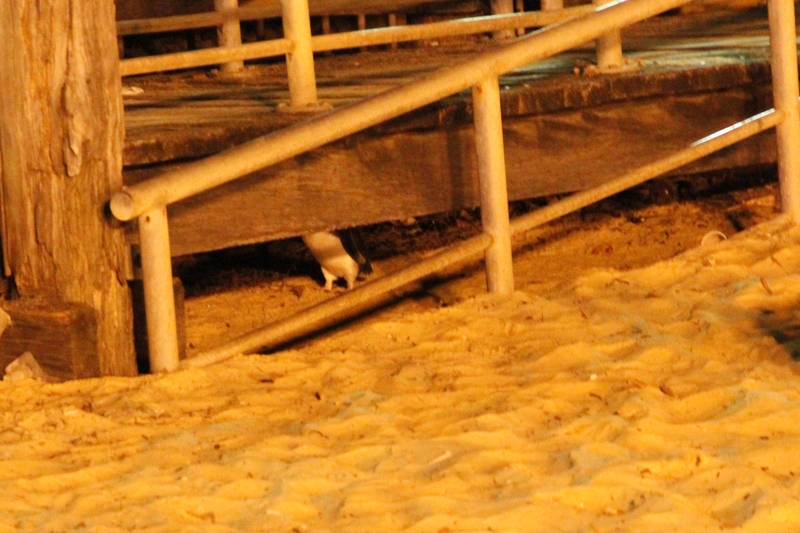 In early September, I finally went to Manly to get my first wild penguin DNA samples. The contractor who monitors the Little Penguin colony at Manly for the National Park and Wildlife Service showed me where the burrows and nest boxes are located and caught a good number of birds for me. I was therefore able to collect 15 samples on the first trip, which was much more than either of us expected. I also got 20 samples from Five Islands, which a ranger from the NPWS has collected for me. That brings me up to 35 samples, which is exactly 10% of the total sample size I am aiming at! Later in September, I went to my first scientific conference at Darwin in the NT, where I presented my project to an audience of conservation biologists. I got some good feedback and learned a lot about other people’s work, including the Places for Penguins project in NZ. It turned out that the situation for the penguins at Wellington seems quite similar to the ones in Sydney, with a mainland colony that is threatened by feral predators and a safer island colony nearby. Next year, I am hoping to go there to sample Little Penguin DNA from New Zealand and extend my study over the whole distribution range of those birds. At the moment, I am getting ready to spend an extended weekend on Bowen Island in Jervis Bay, to capture and mark 50-100 penguins, of which I will also take a genetic sample. I hope they are ready for me and my assistant! Join me for a Marine Discovery Talk about Little Penguins! Enter your email address to follow the penguin blog and receive notifications of new posts by email.